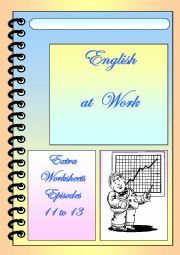 I live in Germany and teach ( part time ) English in a small institute. The text is taken from http://www.eslyes.com/easyread/, the clipart is by 100000freecliparts.com and many thanks to Baiba for a great template. I made this worksheet for one of my weaker students, I hope you can use it too. 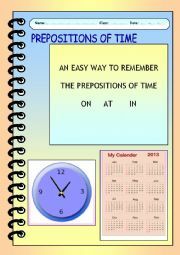 This is an easy way to remember the prepositions of time. 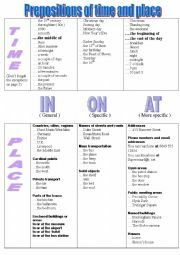 My students found it very useful, I hope yours will too. 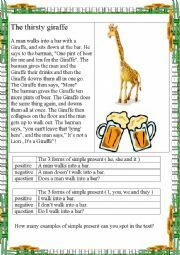 My thanks to Philip R for his advice( on worksheets ) and template. I would also like to thank clker.com and FreeClipartNow.com for the clip art This is a( much nicer ) re-upload of a worksheet that I produced last year. 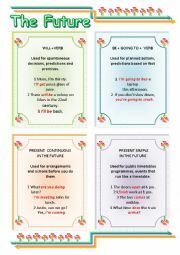 One of the uses of simple present is telling jokes. 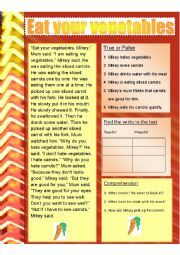 This worksheet can be used for practise in reading and writing. An answer key is provided. Many thanks to Miss Manal for a great template. 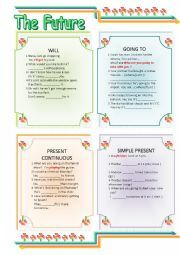 This is the worksheet to go with my grammar guide. 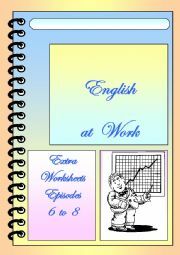 If I knew how to combine separate worksheets, then this would have been attached to the grammar guide. If you know the answer to my problem please send me a mail through ESL printables. Once again , thanks a lot to Jecika for a great template. 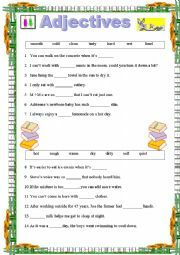 A small worksheet on adjectives with answer key. Many thanks to Miss Manal for a great template.